At some point in this wedding planning process, you’ll probably start to realize that people have a lot of questions. When does it start? What should I wear? Where are you registered? 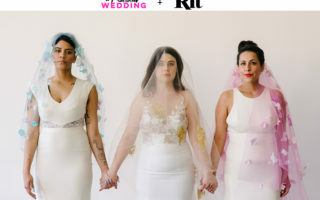 And while it would be lovely to be able to connect with all of your guests over the ceremony location and whether or not a sweater is recommended for the reception, you might be busy. You know, having a job, planning a wedding. Luckily, you don’t actually have to answer all those questions for yourself. Because we’ve partnered with Squarespace to show you how a wedding website can do it for you instead. Think of it like a butler for your wedding, only better dressed. If you don’t want to start from scratch, Squarespace has plenty of templates specifically designed for weddings, available for just $12 per month (and APW readers get 10% off your first purchase with Squarespace when you use the code PRACTICAL at checkout). Scroll down to see real Squarespace wedding websites created by actual couples, then click on any of them to browse Squarespace’s wedding templates or start a free 14-day trial with Squarespace and make your own. 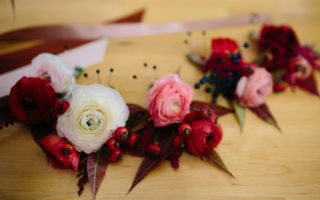 With your annual purchase, you even get a free custom URL, so your wedding guests won’t be burdened with having to remember to visit www.jamieandtoni.weddingtimez.com. Score. Get your wedsite started with the ANYA template! Aubrey’s unique front-and-center design prominently displays your favorite photos and puts your wedding’s most important details where they can’t be missed. Get your wedsite started with the AUBREY template! One of Squarespace’s newer templates, Vow tells your story with a creative scrolling timeline that leads your guests through your history together all the way to the details of your wedding. Get your wedsite started with the VOW template! Charlotte is an easy to use template for that tells your story with beautiful photo galleries, a full-screen header image, and scroll-based navigation. Get your wedsite started with the CHARLOTTE template! Get your wedsite started with the JULIA template! A simple, bold format, Royce invites guests to celebrate good times. Get your wedsite started with the ROYCE template! Have beautiful engagement photos you’re looking to show off? Sonny is exactly the place to do it. Get started on your wedsite with the Sonny template! Do You Know What the Most Important Part of Your Wedding Website Is? There are plenty of prefabbed wedding website options out there. So if you’ve chosen a Squarespace wedding website, chances are you want something you can customize. But where do you start? And how do you avoid falling down the rabbit hole? First step, you can start with our quick and dirty guide to creating a custom wedding website. Then, once you’ve got the design picked and are wondering what the heck should you put in it? We’ll tell you everything you need to include. If the only reason you’re making your own wedding website is because you want something more minimal and modern than what is typically on offer from wedding websites, we totally support that. (It doesn’t have to be all about function, right?) For that, we’ve rounded up our best tips on how to keep your design sleek and streamlined. Want something something sleek but still fancy? Worried because you and your partner aren’t graphic designers. (It’s OK, we aren’t either.) Not a problem. We’ve got three hacks for a hip, modern wedding logo, and you don’t even need to understand Photoshop. Do You Want A Wedding Website That Does Better? This page is sponsored by Squarespace. Squarespace makes beautiful wedding websites happen in a matter of minutes, thanks to their user-friendly software and modern, minimal template designs. Thanks Squarespace for helping make the APW mission possible! Click here to start a free 14-day trial and make your wedding website today. APW readers get 10% off your first purchase when you use the code PRACTICAL at checkout.